These Seemore putters are odd looking but you put them down and stroke them a few times and you realize how comfortable they are and how much effort has gone into their engineering. They are easy to hit – maybe less precise than some, but very good for that groove player that gets hot and starts making everything. The modified mallet head is black with a textured insert face. 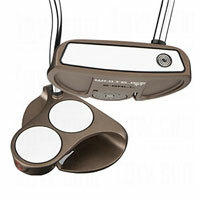 The putter produces a great roll off the face and that’s why it;s in this list. The insert is softer than most (made from thermoplastic urethane) so should be great on faster greens and I found that the putter sets up very easy. It’s obviously that way to give you great feel off the putter face. There is little work to do with these putters. You just set up and your all lined up with toe down. The blade is nickel finished which looks nice. These putters have precision casting from 303 stainless steel ( not as good as precision milled and it shows).